This simple Slow Cooker Rotisserie Chicken tastes like the real deal! 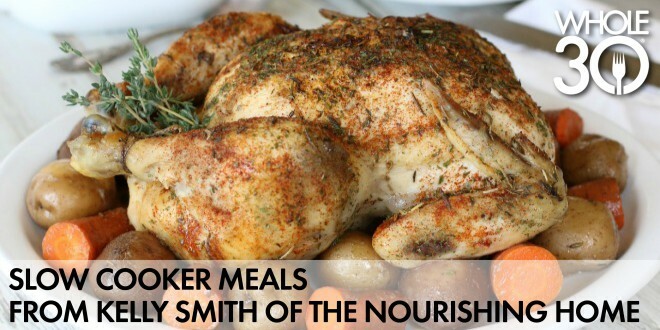 (Dare I say, even better than store-bought rotisserie chicken!) Plus, it takes less than five minutes to toss the ingredients into your slow cooker, making it perfect for busy families on the go! And, you’ll just keep saving time! That’s because this recipe yields plenty of delicious leftovers that can be used to make even more quick-n-easy, healthy meals the whole family will love – whether they’re taking The Whole30 Challenge or not! I love your site and am a regular subscriber. 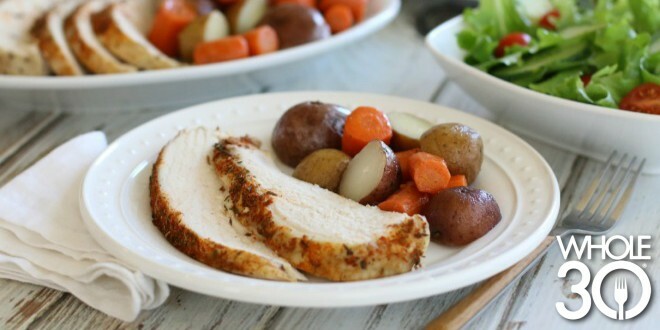 I recently was turned on to this chicken recipe and followed up on how to make chicken broth and I’M HOOKED! I want to feature the original recipe from the Whole 30 site and then follow up with the broth and also some of my own ideas in upcoming blog posts, but am not sure the proper protocol for sharing. I’ve given your site a shout-out and am linking back to both your site and Whole 30, but is it improper to copy the whole recipe? I am adding my own notes and pictures before and after the recipe. I don’t want to do the wrong thing, so I’ll wait to hear from you before I post anything.